Whether you are a business manager, teacher, writer, technician, or student, you'll find Drawing on the Artist Within the most effective program ever created for tapping your creative powers. Profusely illustrated with hundreds of instructional drawings and the work of master artists, this book is written for people with no previous experience in art. AH-HA! I SEE IT NOW! Everyone has experienced that joyful moment when the light flashes on -- the Ah-Ha! of creativity. Creativity. It is the force that drives problem-solving, informs effective decision-making and opens new frontiers for ambition and intelligence. Those who succeed have learned to harness their creative power by keeping that light bulb turned on. 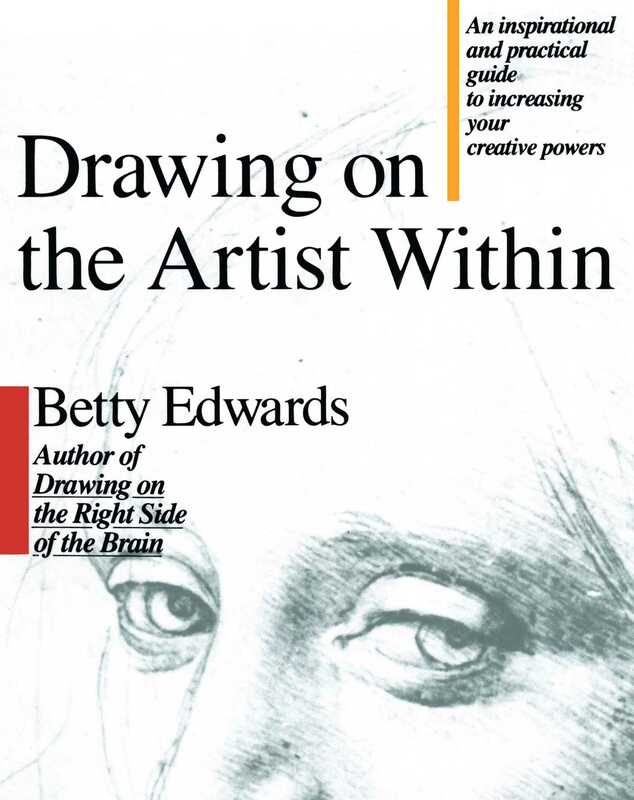 Now, Betty Edwards, author of Drawing on the Right Side of the Brain, the million-copy best-seller that proved all people can draw well just as they can read well, has decoded the secrets of the creative process to help you tap your full creative potential and apply that power to everyday problems. How does Betty Edwards do this? Through the power of drawing -- power you can harness to see problems in new ways. Through simple step-by-step exercises that require no special artistic abilities, Betty Edwards will teach you how to take a new point of view, how to look at things from a different perspective, how to see the forest and the trees, in short, how to bring your visual, perceptual brainpower to bear on creative problem-solving. What on earth is creativity? How can a concept be so important in human thinking, so crucial to human history, so dearly valued by nearly everyone yet be so elusive? Creativity has been studied, analyzed, dissected, documented. Educators discuss the concept as if it were a tangible thing, a goal to be attained like the ability to divide numbers or play the violin. Cognitive scientists, fascinated by creativity, have produced volumes of bits and pieces, offering tantalizing glimpses and hints, but have not put the parts together into an understandable whole. To date we still have no generally accepted definition of creativity -- no general agreement on what it is, how to learn it, how to teach it, or if, indeed, it can be learned or taught. Even the dictionary finesses definition with a single cryptic phrase: "creativity: the ability to create," and my encyclopedia avoids the difficulty altogether with no entry, even though another admittedly elusive concept, "intelligence," is allotted a full-length column of fine print. Nevertheless, books abound on the subject as seekers after creativity pursue a concept that seems paradoxically to recede at the same pace at which the pursuers advance. The trail, fortunately, is at least marked with pointers to guide the chase. Letters and personal records, journals, eyewitness accounts, descriptions, and biographies are in abundance, gathered from creative individuals and their biographers over past centuries. Like clues in a treasure hunt, these notations spur the quest, even though (as in any good treasure hunt) they often seem illogical and indeed frequently contradict each other to confuse the searcher. Recurring themes and ideas in the notes, however, do reveal some hazy outlines of the creative process. The picture looks like this: the creative individual, whose mind is stored with impressions, is caught up with an idea or a problem that defies solution despite prolonged study. A period of uneasiness or distress often ensues. Suddenly, without conscious volition, the mind is focused and a moment of insight occurs, often reported to be a profoundly moving experience. The individual is subsequently thrown into a period of concentrated thought (or work) during which the insight is fixed into some tangible form, unfolding, as it were, into the form it was intended to possess from the moment of conception. This basic description of the nature of the creative process has been around since antiquity. The story of Archimedes' sudden insight, while he was sitting in the bathtub mulling over the problem of how to determine the relative quantities of gold and silver in the king's crown, has put his exclamation "Eureka!" (I have found it!) permanently into the language as the "Ah-Ha!" of creativity. Successive steps in the creative process, however, were not categorized until late in the nineteenth century, when the German physiologist and physicist Herman Helmholtz described his own scientific discoveries in terms of three specific stages. Helmholtz named the first stage of research saturation; the second, mulling-over stage incubation; and the third stage, the sudden solution, illumination. Helmholtz' three stages were supplemented in 1908 by a fourth stage, verification, suggested by the great French mathematician Henri Poincaré. Poincaré described the stage of verification as one of putting the solution into concrete form while checking it for error and usefulness. Then, in the early 1960s, the American psychologist Jacob Getzels contributed the important idea of a stage that precedes Helmholtz' saturation: a preliminary stage of problem finding or formulating. Getzels pointed out that creativity is not just solving problems of the kind that already exist or that continually arise in human life. Creative individuals often actively search out and discover problems to solve that no one else has perceived. As Albert Einstein and Max Wertheimer state in the margin quotations, to ask a productive question is a creative act in itself. Another American psychologist, George Kneller, named Getzel's preliminary stage first insight -- a term that encompasses both problem solving (of existing problems) and problem finding (asking new and searching questions). Thus we have an approximate structure of five stages in the creative process: 1. First Insight 2. Saturation 3. Incubation 4. Illumination 5. Verification. These stages progress over time from one stage to the next. Each stage may occupy varying lengths of time, as indicated in the diagrams below, and the time lengths may possibly be infinitely variable. Only Illumination is in almost every case reported to be brief-a flash of light thrown on the subject. With the notable exception of the Gestalt psychologists, for whom creativity is an unsegmented process, a single consistent line of thinking for the purpose of solving a whole problem, researchers have generally agreed on the basic concept that creativity involves progressive stages which occur over varying lengths of time. Building on this sketchy outline, however, twentieth-century researchers have continued to embellish the elusive concept of creativity and debate its various aspects. Like Alice in Wonderland, it has undergone one transformation after another, thus increasing one's sense that despite a general notion of its overall configuration, this chameleon concept will forever change before our eyes and escape understanding. And now the concept is metamorphosing again. Changes in modern life, occurring at an increasingly rapid pace, require innovative responses, thus making it imperative that we gain greater understanding of creativity and control over the creative process. This necessity, coupled with the age-old yearning of individuals to express themselves creatively, has markedly enhanced interest in the concept of creativity, as is shown in the growing number of publications on the subject. In these publications, one question explored by many writers is whether creativity is rare or widespread among the general population. And the question "Am I creative?" is one we all ask ourselves. The answer to both questions seems to depend on something we usually call "talent" -- the idea that either you have a talent for creativity or you don't. But is it really as simple as that? And just what is talent? The drawing course I teach is usually described in the college catalog as follows: "Art 100: Studio Art for Non-Art Majors. This is a course designed for persons who cannot draw at all, who feel they have no talent for drawing, and who believe they probably can never learn to draw." The response to this description has been overwhelming: my classes are always full to overflowing. But invariably one or more of the newly enrolled students approaches me at the start of the course to say, "I just want to let you know that even though you've taught a lot of people how to draw, I am your Waterloo! I'm the one who will never be able to learn!" When I ask why, again almost invariably the answer is "Because I have no talent." "Well," I answer, "let's wait and see." Sure enough, a few weeks later, students who claimed to have no talent are happily drawing away on the same high level of accomplishment as the rest of the class. But even then, they often discount their newly acquired skill by attributing it to something they call "hidden talent." I believe the time has come to reexamine our traditional beliefs about creative talent -- "hidden" or otherwise. Why do we assume that a rare and special "artistic" talent is required for drawing? We don't make that assumption about other kinds of abilities -- reading, for example. What if we believed that only those fortunate enough to have an innate, God-given, genetic gift for reading will be able to learn to read? What if teachers believed that the best way to go about the teaching of reading is simply to supply lots of reading materials for children to handle and manipulate and then wait to see what happens? Such a teacher would, of course, never tamper with a child's spontaneous attempts to read for fear of spoiling "creativity" in reading. If a child asked, "How do you read this?" the teacher would respond, "Just be free! Do what comes into your head. Use your imagination and just enjoy it! Reading should be fun!" Then the teacher would watch to see which children showed "talent" for reading -- the idea being that it's no use trying to teach the skill of reading because if a child isn't "talented," instruction won't help. It's easy to see that if this were the situation in reading classes, probably only one or two or perhaps three children in a class of twenty-five might somehow manage to learn how to read. They would be designated as "talented" for reading, and no doubt someone would say, "Well, you know, Sally's grandmother was good at reading. Sally probably got it from her." Or "Oh, yes, Billy's good at reading. The family is quite literate, you know. It's in the genes, I guess." Meanwhile, the rest of the children would grow up saying of themselves, "I can't read. I haven't got any talent for it, and I'm sure I could never learn." What I've described, of course, is more or less the way it is with drawing. Surely parents would object mightily if the concept of talent were used as a roadblock in learning to read the way it is used in learning to draw. But for some reason, most people, parents and students, accept the verdict "No talent for drawing" with quite surprising meekness and even crestfallen agreement. This situation continues right up to college art classes. There, anxious students, already worded because their drawing skills are weak and fearful that they have no talent, are sometimes confronted on the first day by an instructor who might start the course with "Well, there's the still-life setup. Do a drawing of it." All too often the students fear an implied warning: "...and we'll see which of you should stay in this class." A comparable situation might be to enroll in a beginning French conversation class and to be told at the start, "Go ahead and talk in French," with an implied warning that if you can't already speak French, you shouldn't bother to stay. Very few college students in art classes, I imagine, would stand for that. Yet students usually don't object to noninstruction, as they surely would in almost any other course, perhaps because they feel so bad -- almost guilty -- that they have no "talent" for drawing. Talent is, indeed, a slippery concept, no matter what the form of creativity. But perhaps "artistic talent" has always seemed rare and out of the ordinary only because we expect it to be rare and out of the ordinary. We have become accustomed to thinking of artistic ability as basically unteachable, and teaching methods have remained unexamined. Moreover, many educators, parents, and students have shared an unspoken belief that artistic abilities are largely nonessential in our modern, technological society. Yet we do value creativity. We constantly seek ways in which to be more creative ourselves, whatever our occupations or fields of interest. But must we have a mysterious God-given talent to be creative? Or is it possible that creativity can be taught? In my work with groups of artistically untrained people, I have discovered that any person of sound mind can learn to draw; the probability is the same as for learning to read. It is simply a matter of learning basic perceptual skills -- the special ways of seeing required for drawing. I claim that anyone can learn enough seeing skills to draw a good likeness of something seen "out there" in the real world. Once these basic perceptual skills are learned, their use can be as varied as subsequent uses of basic language and arithmetic skills. A few individuals may stay with art and eventually become artists, just as a few stay with language or mathematics and eventually become writers or mathematicians. But almost everyone can use perceptual skills -- again, like language and math skills -- to enhance thinking skills. To go a step further, I propose that perceptual skills are deeply involved in the five stages of the creative process. I also propose that visual, perceptual skills are enhanced by training, just as the verbal, analytic skills benefit by education. And finally, I propose that learning to see and draw is a very efficient way to train the visual system, just as learning to read and write can efficiently train the verbal system. That is not to say that the visual system is better, morally or otherwise, than the verbal system. But the two systems are different. And when trained as equal partners, one mode of thinking enhances the other, and together the two modes can release human creativity. At present, our culture provides few opportunities for such training. We are used to thinking by means of the language system of the brain, and that mode has proved its effectiveness over the centuries. But we are only now beginning to understand the complex dual functions, verbal and visual, of the human brain, and new possibilities are opening up. As I see it, unlocking the doors to perception and releasing the potential for creativity is a twofold process: first, removal of the deterrent concept of talent as a requirement for learning basic perceptual skills; second, teaching and learning based on new knowledge of how the human brain works. My claim is quite modest: if you can catch a baseball, thread a needle, or hold a pencil and write your name, you can learn to draw skillfully, artistically, and creatively. Through learning to draw perceived objects or persons, you can learn new ways of seeing that guide strategies in creative thinking and problem solving just as, through learning to read, you acquire verbal knowledge and learn the strategies of logical, analytical thought. Using the two modes together, you can learn to think more productively, whatever your creative goals may be. The products of your creative responses to the world will be uniquely your own, your mark on the world. And you will have taken a giant step toward attaining a modern brain. For in the years ahead, I believe that perceptual skills combined with verbal skills will be viewed as the basic necessities for creative human thought. Dr. Betty Edwards is Professor of Art at California State University, Long Beach. Her original contributions to the art of drawing and creativity have reached far beyond the college classroom where she has taught for many years. Her work has been praised by a wide range of distinguished psychologists and educators, and she has conducted creativity seminars and workshops for leading businesses including IBM and General Electric.